We now have a choice of shield profiles, the Low Dome or the High Dome. The Low Dome shield, apart from being less obvious under clothing, is also less likely to be pushed aside by a car seat belt, work, sports, gardening etc. Both High & Low Domed Shields are supplied with an elasticated belt, or if requested, can be made for temporary attachment to the Sash Stoma Hernia Support Belt HB102. attached to a domed plastic shield that is worn over the stoma and pouch. 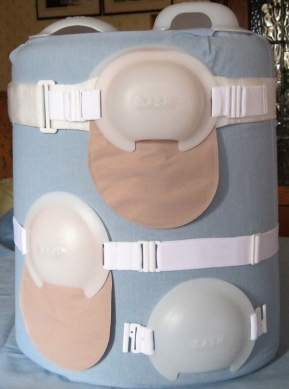 The shield is suitable for a Colostomy, Ileostomy, Urostomy and umbilical hernias. The domed shield has a cut-away section at the bottom of the shield to allow waste matter to drop into the bag section of a pouch. The elasticated belt has a quick release fastener and a belt length adjuster, both in plastic, and is not detectable by security arches or wands. Wearing the stoma shield:- Your pouch should first be placed over stoma in the usual way, then place the shield in position over the pouch/stoma and fasten belt around the waist. The shield, shown at the bottom of the photo can be adapted to fit onto a SASH Stoma Hernia Belt and will give a very solid base. The belt and Shield must be ordered at the same time so that additional plastic clips can be added to the belt and shield for fastening. PLEASE NOTE WE DO NOT ACCEPT ORDERS OR REQUESTS FROM ANY SUPPLY COMPANY OR PHARMACY FOR THIS MADE TO MEASURE ITEM. ALL PATIENTS MUST CONTACT US DIRECT IF THEY NEED A PRESCRIPTION REQUEST SENT TO THEIR GP. On which side of your body is the stoma ? Waist size Inches ……….... or Centimetres…….…..
Or pay by BACS to:- Barclays Bank, Sort Code 207093, Account No. 70702153. GDPR "Consent of the data subject means any freely given, specific, informed, and unambiguous indication of the data subject's wishes by which he or she, by a statement or by a clear affirmative action, signifies agreement to the processing of personal data relating to him or her." Sash Medical Ltd do not share personal information with any other body other than NHS GP surgeries.